Kindness Cards couldn’t be simpler, easier or more kind. Get in the act! 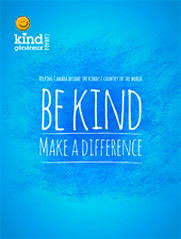 Kindness cards are a fun way for Canadians to create a wave of kindness from coast to coast to coast and share 1.5 million acts of kindness in time for Canada's 150th Anniversary. 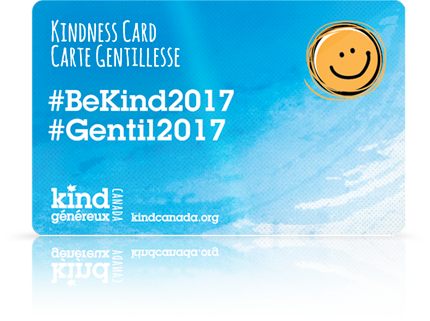 Using a Kindness Card is as easy as 1,2,3! Lucky you! Let’s get started. Visit this page to enter your unique card number to reach your kindness card page. Enter your name, email address and location. If you are ready to share a kindness story, complete the Share a Kindness Story Now section and submit it. If you do not have a story yet, simply save your contact information and we will send you an email with a link for when you are ready to return to your page. We are not kidding when we say there is kindness in every card. Pass your card along to someone who has been kind to you or others. Tell them about your experience, and how they can keep spreading kindness. Do not forget to come back to read the stories that have been added to your card.